“The 663 Chip Man” from Christian Faith Publishing author Johnny Hayre is a breathtaking narrative of evading capture, and reclaiming lost love while saving the world. Implanted with the popular 663 brain chip, Michael Morgan uncovers the chip designer’s plan to take over the world using Michael and his chip. 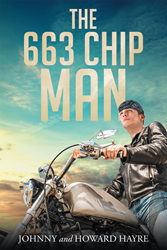 “The 663 Chip Man”: a gripping adventure of technology, deceit, and ultimate redemption. “The 663 Chip Man” is the creation of published author, Johnny Hayre, who resides in North Texas, where the story takes place. Johnny is a former engineer, avid musician, and woodworker extraordinaire. Published by Christian Faith Publishing, Johnny Hayre’s new book tells the extraordinary tale of Michael Morgan, who as a teenage orphan went for a routine checkup and woke up implanted with a 663 brain chip, the precursor of the Biblical 666 chip. Michael escapes from his abductors using his world-renowned chip expertise and sets out to find his missing fiancée while evading his former captors, the paparazzi, and even the police. While on the run, Michael discovers that the situation is worse than he could have imagined. The chip’s designer aims to control the world. Michael must stop him! View a synopsis of “The 663 Chip Man” on YouTube. Consumers can purchase “The 663 Chip Man” at traditional brick & mortar bookstores, or online at Amazon.com, Apple iTunes store, Kobo or Barnes and Noble. For additional information or inquiries about “The 663 Chip Man”, contact the Christian Faith Publishing media department at 866-554-0919.